The NHL revealed the full 2018-19 regular-season schedule Thursday. 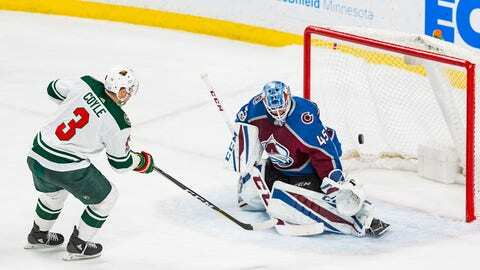 The Minnesota Wild open the season Oct. 4 on the road against the Colorado Avalanche, then return home for their home opener Oct. 6, a meeting with the Vegas Golden Knights. The Wild play seven of their first 10 games at home, then embark on a seven-game road trip, the longest in franchise history. Minnesota swept a three-game regular-season series against the Golden Knights, who advanced to the Stanley Cup Final, last season. The Wild have a five-day bye following the All-Star Game on Jan. 26, and will play on back-to-back days 15 times. The Wild face central division foes Chicago, Colorado, Nashville, St. Louis, Dallas and Winnipeg a combined 26 times. Their divisional slate includes four games each (two at home and two away) against the Blackhawks, Avalanche, Predators and Blues. They’ll take on the Stars twice at home and three times on the road, and face the Jets three times at home and three times on the road. Minnesota will also square off with each member of the Pacific Division three times, and face each Eastern Conference team twice.